Offering you a complete choice of products which include hplc column telescopic railing cabinet, hplc column storage cabinet and hplc column safety cabinet. 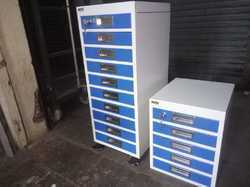 HPLC COLUMN STORAGE SYSTEM / UNITS . 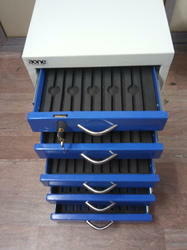 Most Convineant ans Suitable to Store your HPLC Columns . 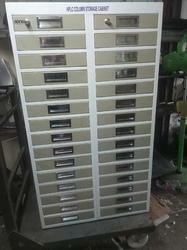 Provided with easy roll on Shelfs / Drawers . Each Drawer can accomodate 10 Columns . Our standard systems are of 50 Column, 100 ,150 ,200, 500 Column Storage capacity . Castor Wheel Mount for easy movement . Costomised Also As Per Requrment developments, these offered cabins are manufactured making use of excellent grade basic material together with advanced tools and machinery. Moreover, we assure delivering them to our customers on time. Store up to 12x12.5cm columns in a single drawer or a combination of shop columns, guard columns and analytical columns. Holds all columns up lo 30cm long. With Lock and Key Facility.